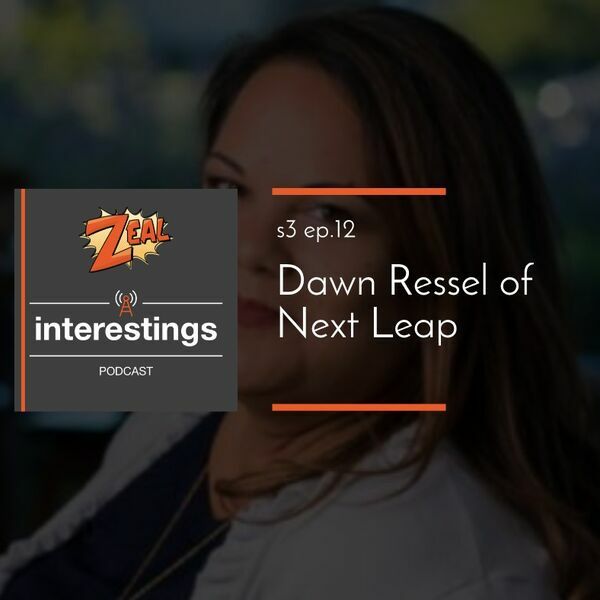 Dawn Ressel of Next Leap Design gives us some powerful techniques from the UX research and design world. We touch on user testing, design systems and how Dawn weaves the causes that she cares deeply about into her consulting practice. Speaker 1:0:01Welcome to the zeal, interesting podcast. I'm your host, Chris White. My cohost is trevor yearish today. Thank you so much for joining me again, trevor. Of course. I'm super, super excited for this podcast. So yeah, me too. Me Too. So let's introduce our guest, Don Russell. She's the CEO and design strategist at next week. Thank you so much for joining us, Don. Thank you for having me. We got an intro from you from April wensel. Thank you very much. April. She's excellent with her. Was really fun. Definitely excited. Based on her recommendation. You're the founder of a consulting organization. You serve clients. You do use your experience in design and so can you kind of give us a background of your background in technology and what brought you to doing your own a service organization? Speaker 1:1:44yeah, for people like myself and others in our audience, can you kind of give us a short definition of a design system at a larger organization? Speaker 1:2:37so instead of creating a style guide artifact that falls, falls completely by the wayside within a few months, you actually create a system through which design was delivered to all the individual projects. Speaker 3:3:06a big heartfelt thank you on behalf of all of the companies in the world that uses intuit products for the effort and focus on making the products easier to use cross platform friendly. All of those different things. I didn't know the company, the company is massive, but just to hear that focus and emphasis, it's. It makes a massive difference to people who use the product every single day. Speaker 1:3:59yeah. So give us the story of how you transitioned from managing a team inside of a very large organization deciding that you wanted to start a service organization. Speaker 2:4:10Well, it wasn't exactly a straight line to be honest, but you know, I, I felt like in summary, you know, I had been at intuit for nine years and a variety of roles. And I guess the headline is I felt like I had accomplished what I set out to accomplish within those four walls. And so I knew there was something next for me. I didn't know for a little while, but it was actually going to become next leap. So I actually started interviewing for jobs, traditional user experience design manager jobs in Silicon Valley and I'm just thinking, I actually live in San Diego now, but I was thinking, well maybe I need to relocate back to the bay area. That's where all the jobs are. And through the process of interviewing with honestly some really great companies, I just felt that none of it was resonating with me and so how to do a lot of internal reflection on. Speaker 2:5:14Okay. It wasn't just that into, it wasn't resonating with me. It's that really this job inside of any four walls is not resonating with me. And why is that? And so what I learned through the process of, of self reflection was that the work that I was doing on the side while isn't added to it was actually the most meaningful work that I had done personally most fulfilling, um, in the last few years of my career. And that was working with nonprofits on the side and applying design thinking and innovation techniques that I learned at, at, into it to the nonprofit sector. And when I realized that that was the thing that was going to be what would make me excited to wake up every morning, I started looking for those types of jobs in the nonprofit sector. It only took me a couple of days to realize that nobody in the nonprofit sector as a full time job for this. Because to be honest, they haven't figured out that they actually, most of them hadn't figured out that they need this. They didn't understand that they needed user experience. They haven't figured that out yet. So I thought, Oh, I've got to make this happen. And so it wasn't that I had the ambition to start a company, it was that I had the ambition to do this work and I felt that starting a company was the only vehicle in which to accomplish that. So. Speaker 3:6:43So you just mentioned something that I wanted to jump into dive into a little bit. During career progressed, I noticed that you started speaking more actually speaking on different topics and one of those topics was empathy. And that's natural. That's been a natural progression of sort of Ux work as well as, you know, really digging into design thinking and these types of things. And um, so you just mentioned that it was hard, it was hard. The hard part is helping a business understand what it is and why they need it and why it's in the companies that are on the other side of that understanding. Totally get it. And they're like, I don't know, you know, the world wasn't colorful before this moment, you know. And so what I would love to sort of dig into a little bit is how do you sell empathy acquisition or how do you sell? How do you, how do you help people like cross that cat businesses cross that chasm of understanding? Speaker 1:8:56the right donors, you're losing customers. Speaker 2:8:59And that's the thing that nonprofits and for profits have income in common is they're always concerned about money. And so a lot of times with nonprofits all I'll start building relationships with people in the fundraising capacity because they can tell me their story of where, where the gaps are in terms of getting the money and I'm not a grant writer or anything like that. I, I refer them to grant writers. But a lot of times they think the silver bullet is we just need a better grant writer. And the reality is a lot it is much, much more complicated. You know, a lot of times they're not telling the right story or they're not delivering the right programming or they're not, you know, whatever they're saying isn't resonating with people in a way that needs to, for them to get the donations or revenue that they want. So I always tie it back to money. I never go in and say you should do empathy for the sake of empathy because it's the right thing to do. It doesn't sell. Speaker 3:9:54How does it, how does it tie back to money? Do you reference past experience that you have mentioned? Do you bring in like what are the types of things that help you get that point across the. Speaker 2:10:08Yeah. Well also I guess for nonprofits, the other thing that sells his impact as well, so I either figure out what their biggest pain point is. Is it, is it money or is it impact, but on the finances side it's usually around, you know, are you telling the best story to your donors or if you're a for profit, do you know why your customers are choosing your competitors over you? And a lot of times I don't know. So why are, why are your customers, why isn't everyone your costs? Not that everyone is going to be your customer, but everyone who could potentially be your customer, why are they choosing other products in the marketplace? Speaker 1:10:46Yeah. So identify those arguments against the product or reasons why people leave the product. Speaker 2:10:52Yeah. Yeah. Or how do you create, you know, don't you want to create a fanatical set of customers that is going to promote your brand for you? You know, how much money do you invest right now in marketing? Wouldn't it be great if you could reduce that amount because you have so many fanatical customers promoting on your behalf on social media, you know, so, so if I can tie it to those things and they're like, well, gee, how are you going to help us do that? Are you going to come up with a new marketing strategy or something like that. We already have a marketing firm. I'm like, no, that's not what I do. I actually help you understand much more deeply who your customers are and what they care about. And that is input from marketing, but it's input for your whole business really. So No. Speaker 2:11:55on the for profit side, it's often that they had this great idea they thought, which they thought was a great idea, but you know, they didn't do the upfront work to validate whether or not there was a need for it in the marketplace. And so a lot of times it's either helping them reimagine that product or, or even maybe even just the messaging is off, but the product is right. Um, so yeah, it's just figuring out how do they better align their products, services and messaging with what the customers actually value and want, um, and align it with their actual behavior so that they'll, they'll do what the companies want them to do, which is buy their product or service. So yeah, that's pretty much it. On the nonprofit side, one of the biggest things I see is that, you know, the nonprofit industry is being disrupted right now. A lot of the funding sources are drying up. There's more competition for the same limited set of funds and uh, they need to create additional sources of revenue. And so social enterprise is a big area of opportunity for a lot of nonprofits right now. I would, I like working with them to help them figure out is there an opportunity for social enterprise that's aligned with your mission or even a strategic corporate partnership that's a line with your mission that can help funnel more revenue into your organization so you can do great work. Speaker 2:13:33correct the towel. She and I worked together at intuit on the intuit design system and uh, we just clicked basically on day one when we started working together because she had a sticker on her laptop, you know, in corporate America. A lot of people like to decorate their laptops with stickers and yeah, she had a sticker on her laptop for an organization called mercy for animals that I'm a huge, huge fan of. They do work on behalf of helping farmed animals and, and suffering for farm animals. And I looked at that and was like, that's interesting. So I said, hey, you know, tell me more about mercy for animals. I'm a big fan of the show and she starts telling me, Oh yeah, they do great work, blah, blah blah. And here she is thinking like I may probably not familiar with that organization at all and she's in a corporate setting trying to be a little bit discreet about the fact that it's a Vegan organic. But uh, I was like, Hey, um, do you happen to be Vegan? And she's like, yes. And I said, yeah, me too. It's become so much more than that. But yeah, we were delighted when we found out our person, our team of three, it was two thirds Vegan because, and, and hundred percent female. So he's going imagine how rare that is at a technology company to have a two thirds Vegan, 100 percent female project team. So we were basically, you know, joined at the hip from day one and now now we have fleet together. Yeah. Speaker 1:15:27Very cool. I wanted to, that dovetails well into a question that I really wanted to ask you about when I was doing research. I saw on your blog that you do a lot of writing about animal advocacy and veganism. It sounds like you have a very deep personal interest in the topics, but do you find that that also dovetails well into what next sleep does and like how you. How do you weave that into what you do as a business? Speaker 2:15:51Well, yeah, it's a great question and it's one that I am considering going to evolve the answer to. So you know, really the reason I started next leap was I wanted to do work that was aligned with my personal passion and work that I felt was doing good in the world and I've been vegan for 17 years, so that is a huge part of what I, I want to see a shift in the world is how we treat animals and what we eat and the impact that that has on the environment. So I decided that veganism should be a focus of my business because it's a focus of my passion and also Lisa Passion and we're still continuing to figure out exactly how that's going to show up in our business. But I'll tell you what we've done so far. So right now I run a workshop series called kickstart your Vegan business. Speaker 2:16:45And it is. Yeah, I've done it now in three cities. They'll actually three times two in San Diego, once in Berkeley and I'm going to offer it in London, in the UK in October. I just happened to be going there and I was like, that would be a great place to run this workshop in London and then I'll be running it in la in November. And so, um, that's one way that I'm, I'm doing it with sleep because I feel that the things that I learned in silicon valley can be used to grow any business. There's really no businesses. I want to see you succeed more than Vegan businesses. So the more I can help grow that economy from the ground up, I think the better off we're all going to be. So. So that's one thing I'm really passionate about. That's one way I'm to achieving that through next sleep. But I'm also going to a conference next week that's called the good food conference and uh, they're going to be doing a free live stream. So her, anyone who, where's that going to be in Berkeley, California, that whole conference is about growing the plants, meat and clean meat sector, uh, and cleaning his lab. And the goal of that industry is to completely disrupt the factory farming industry so that we don't even need to have animals to produce meat that tastes exactly like me. Right. Speaker 2:18:21It technically is me. Yeah. So what we do today is incredibly inefficient. You know, we grow, raise a whole animal to eat the muscle fibers. And so what clean meat does is it says, Hey, all we need to do really is biopsy from live animals, take those cells and grow them in a lab and then turn that into muscle fiber. That is exactly the same thing as me. And so this conference is the first. This is the inaugural conference. Yeah. And is it in Berkeley related companies in that area or. I'm not sure why it's in Berkeley, but the, well the bay area's definitely an epicenter for this industry, but I'm not exactly sure why it's in Berkeley specifically, but um, yes, so I'm really excited about that conference and if you see what's happening in the industry, you know, consumers are choosing plant based alternatives in at rates that are exponential and so the sector is growing like crazy and there's no end in sight. Speaker 2:19:29And so my hypothesis with next sleep is that, hey, you know, there's a space for next leap to play in this industry. There's certainly enough money there to um, support and entire consulting business. There's billions and billions of dollars. I mean Bill Gates and Richard Branson are investing in industries just as, as examples, you know, Leonardo Dicaprio, like all these huge names are investing in this industry. So part of my investigation and hypothesis testing is going to happen. Actually good food conference on, you know, where our next leap can fit in, in a bigger way than them. I'm just working with the startups, but working with bigger companies. Speaker 3:20:18That's awesome. I want to maybe shift focus for a few minutes and ask a question, uh, being a consultancy ourselves as zeal and one of the things that always fascinates me about other consultancies is how they do what they do and how they're successful at it. Because being a consultancy is, is tough. It has a lot of challenges involved in it. So both selfishly as well as I know we have a lot of listeners on our podcast that are also involved in consultancies. So one of the questions I love to ask is just from a high level as well as a are there, are there details that stand out, things that stand out, not entire process or anything like that, but just sort of through your client process, onboarding, reporting, updating, tooling. The question that I have is what are some of the things that you have experienced maybe in the last year of of start really getting sleep going and whatnot that have made a huge difference in how you work with your clients. And again, that's a really broad topic. Maybe something that happened recently that really stood out to you or some of the things that you know make a huge difference when you're working with clients. That is a key distinction that other. Speaker 2:21:38I mean I have the good fortune of having skills and talents that naturally has to be applied collaboratively. I literally cannot work in a vacuum, so I'll share what I do and hopefully it's more broadly applicable to people in other industries. For instance, when I do ideal research project, I require my clients to sit in on all of the interviews and listen, so I don't just deliver them a report at the end. I want them there for the whole journey. So either they listened to it live or they listen to the recording, but ideally they listened to it live and what I did with my last client where we did a research project like this, they were in every single interview live and then we half an hour afterwards debriefed and every single interview and the reason that was important was because they have a different perspective. You know, I'm hearing what I'm hearing from an objective perspective, but they're hearing what they're hearing from their very emotionally invested in what you're talking about and they know the topic really well and so I want to know what they found important in that interview as well as what I found important. Speaker 3:24:02do you let a lot of your ideas that come up in the process of research and you let a lot of those ideas surface. I know I've talked to a lot of consultants and ourselves as well. I'm like 80 percent of being a good consultant is asking good questions, right. Is being a good question asker and then there's this consulting part which is where you help them work through that. But usually that's with more inquiry and more questions and then there's, you know, the piece where it's, you have expertise in this area as well and bring forth some ideas. So I just, what, what does that look like? Speaker 2:27:09what they give me an answer and I'm like, okay, so tell me how you, how you know that, and then you know, it's not real. It's not really supported in any way other than maybe just anecdotally or even a well, well that's how we do it or that's how we feel, you know? And so I usually like to start with research and usually they were, they really can benefit from it, but in some cases I'll just go in and do like innovation workshops. So if they have already identified a problem and kind of have already narrowed in on what their customer pain or problem is, I might just go in and help them figure out how to launch them lean experiments to test different ideas in the market or, or even generate ideas to potential solutions and then pick her up a strategy for how they can test that in a lean way. Speaker 1:27:58That's awesome. I think that's actually an excellent place to start wrapping up. But before we go, I definitely wanted to ask you, dawn if there's anything project wise or link wise that you've collected your listeners' attention to. Speaker 1:28:49yeah, we'll include some links in the show notes for this podcast. Uh, you know, we're, we're time travelers here, so this podcast will likely come out after that conference and we'll see if they have any kind of recordings up. That would be very interesting. Speaker 2:29:05I love that future. Our future selves are transporting. Speaker 1:29:11Exactly. Exactly. Well, thank you so much, Don. Super Informative. I learned a lot. I really, really enjoyed it. Thank you so much. Speaker 2:29:22Thank you for having me. This is great. Speaker 1:29:24Definitely. And to your listeners, thanks again for listening. If you'd like to learn more, you can follow us on twitter at coding seal and we'll include some links to a website in the show notes. So please give her a visit and we'll see you next time. Thank you.